Between 1947 and 1953 the U. S. Government became highly committed to keeping all information on ETs and UFOs concealed from the population at large. For the ensuing sixty years this effort has been largely successful, although the shroud of secrecy has been gradually eroded by the persistence of many individuals over the years who have investigated and published books that seriously treated the idea that the government is keeping its information on the subject under wraps. This is what's known as 'the truth embargo'. One long time advocate of this view is Laurance Rockefeller, who has championed an intiative for full disclosure called the Rockefeller Initiative. 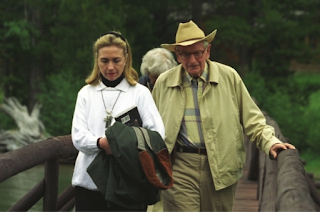 Hillary Clinton and Laurence Rockefeller in 1995. Clinton is holding a copy of Are We Alone: Philosophical Implications of the Discovery of Extraterrestrial Life by Paul Davies. This initiative has gained greater attention as the message is given serious discussion by political figures like Hillary Clinton and John Podesta, a former adviser of Barack Obama and chief of staff to President Bill Clinton. In a recent article in an on-line publication called The Observer, Robin Seemangal reveals a statement made by democratic presidential candidate Hillary Clinton that, if elected, she would like to get to the bottom of the allegations of a long standing truth embargo on the ET subject within the U.S. Government. “Yes, I’m going to get to the bottom of it” said Clinton when questioned on the subject by reporter Daymond Steer.“I think we may have been visited already. We don’t know for sure.” Click here to see the entire article by Robin Seemangal. Personally, I have no access to secret government information but I have spent fifteen years independently investigating whatever evidence I could gather that spoke to the issue of whether extraterrestrials may or may not have some involvement in the affairs of humanity. While my evidence cannot be described as incontrovertible, it does paint a compelling picture of an extraterrestrial presence here on Earth that dates back to the dawn of humanity. 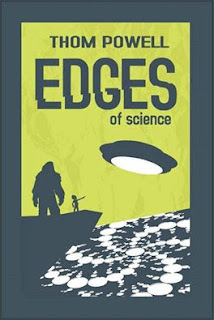 It's all there in my latest book, Edges of Science, published by Willamette City Press. To summarize, my personal findings are completely consistent with the considered opinions of Laurence Rockefeller, Steven Greer, Stanton Friedman, and many others who have taken up the cause of 'full disclosure'. And so, I will take this opportunity to offer praise and support for these courageous individuals. I also applaud candidate Hillary Clinton for having the courage to broach this politically risky issue at a campaign appearance in New Hampshire. Full disclosure: I'm a registered Democrat, so I already support Clinton the candidate, but her recent statements to the editorial board of New Hampshire's Conway Daily Sun are another big reason why I support Clinton's candidacy. 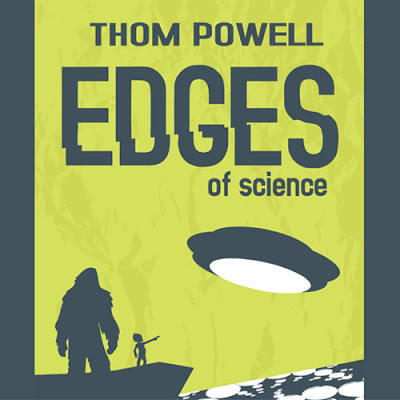 If my political affiliations have not alienated you, consider checking out my latest book, Edges of Science, which treats this and several other fascinating subjects that are loosely categorized as 'paranormal.' No matter what your political tendency, Edges of Science will probably alien-ate you! Using the comments to stoop to name-calling (e.g. "liar" and "fool") does not sit well and I will delete these comments as well for that reason. Yes, politicians will say anything to get elected but at least she is saying it. None of the other candidates have any comment on the matter and I find that heartening. I will also add that Fox News is hardly a credible source of information, especially with regards to liberal Democratic candidates. If you are going to make a case against Hillary Clinton, your source is going to have to be better than Fox News. Thank you for the comments and for reading the books. Mind your manners on the comments if you want them to stay up. No name-calling. Oh Thom...say it isn't so! Please watch this 13 minute video about Hillary.